NOTE! MANUAL KIT SHOWN. POWER KIT ALSO INCLUDES BOOSTER. The manual brake kit (Only) is compatible with 63-69 Falcon/Comet (60-62 as well with 63-65 control arm replacement), 65-73 Mustang, 67-73 Cougar, Maverick/Comet, Granada/Monarch, and some Torino. This kit installs onto existing V8 drum brake type spindles. The spindles are not included. Users with 6 cylinder cars will need to acquire and install 8 cylinder type spindles. 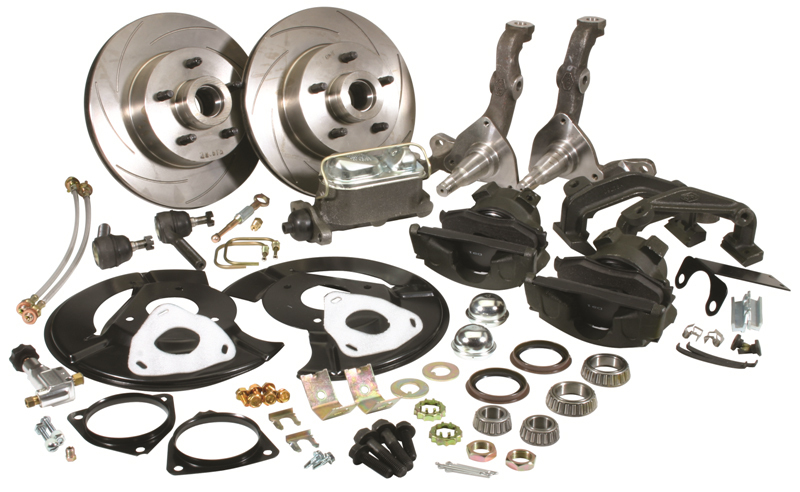 The kit includes everything needed to swap out your front drum brakes for OE type "KH" Kelsey-Hayes type 4 piston caliper front disc brakes originally found on 1965-1967 V8 Mustang and other 60's Ford cars. All new parts including a dust shield kit, caliper brackets, corrosion protected calipers, brake pads, brake hoses, hose brackets and attachment hardware, adjustable proportioning valve, residual pressure valve, master cylinder, master cylinder outlet adapter(s), an adjustable pushrod (manual brake applications), wheel bearings, wheel seals, caliper attachment hardware, wheel attachment hardware, dust caps, performance slotted rotors with bearing races pre installed, Grade 8 attachment bolts, red thread locker. Note that you will need to adapt or re-fab your hard brake lines to accommodate the proportioning valve, the residual pressure valve, and the master cylinder. Most original V8 type14" wheels will fit this conversion. This is the kit that you should choose if you desire to use your original wheels and/or maintain "originality"
***NOTE! MANUAL KIT SHOWN. POWER KIT ALSO INCLUDES BOOSTER. The manual brake kit (Only) is compatible with 63-69 Falcon/Comet (60-62 as well with 63-65 control arm replacement), 65-73 Mustang, 67-73 Cougar, Maverick/Comet, Granada/Monarch, and some Torino. The kit includes everything needed to swap out your front drum brakes for OE type front disc brakes originally available on 68-73 Mustang. They are technically correct for 70-73 Mustang, but the 68-69 OE differed only in that their spindles have a smaller pin. This kit uses the larger "Boss" type pin used after 1969. Our spindles use the "Granada spec outer tie rod hole. All new parts including high strength alloy steel spindles, a dust shield kit, caliper brackets, corrosion protected calipers, semi-metallic pads, brake hoses, hose brackets and attachment hardware, adjustable proportioning valve, residual pressure valve, master cylinder, master cylinder outlet adapter(s), an adjustable pushrod (manual brake applications), wheel bearings, wheel seals, caliper attachment hardware, wheel attachment hardware, dust caps, performance slotted rotors with bearing races pre installed, outer tie rods correct for your application, Grade 8 attachment bolts, red and blue thread locker, and caliper lube. Note that you will need to adapt or refab your hard brake lines to accommodate the proportioning valve, the master cylinder, and the brake hoses. This kit will apply to all of the applications noted above, it is your best choice if you wish to use the original wheels on 69+ cars, and/or wish to maintain "originality" on those same applications. Your original 1968 and later 14" wheels will fit this conversion. Earlier wheels may fit. 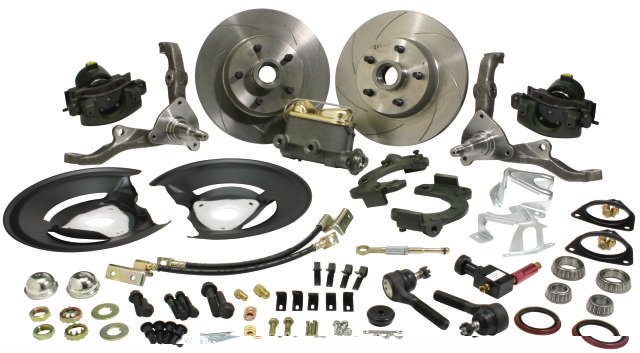 The kit includes everything needed to swap out your front drum brakes for "Granada" type OE style disc brakes. All new parts including high strength alloy steel spindles, a dust shield kit, caliper brackets, corrosion protected calipers, semi-metallic pads, brake hoses, hose brackets and attachment hardware, adjustable proportioning valve, residual pressure valve, master cylinder, master cylinder outlet adapter(s), an adjustable pushrod (manual brake applications), wheel bearings, wheel seals, caliper attachment hardware, wheel attachment hardware, dust caps, performance slotted rotors with bearing races pre installed, outer tie rods correct for your application, Grade 8 attachment bolts, red and blue thread locker, and caliper lube. Note that you will need to adapt or refab your hard brake lines to accommodate the proportioning valve, the master cylinder, and the brake hoses. Your original 14" wheels will not fit this conversion.